GranataPet DeliCateΒen is an easily digested, high protein cat food with a moderate fat content. A cat's digestive system is naturally set up to proceΒ protein-rich foods, but they find it much more difficult to digest and metabolise grains. Granatapet dry foods are made without grains, providing your cat with a species-appropriate and natural diet. 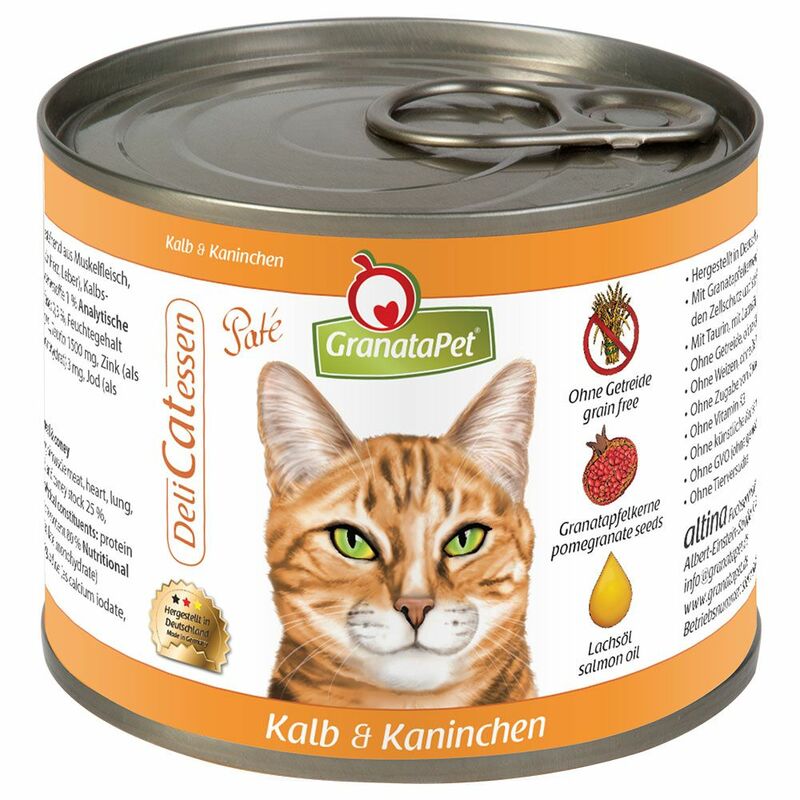 Granatapet foods are made in locations in Germany and Austria, using only the finest and freshest ingredients. The raw materials are prepared using cold fill technology and steam-cooking to preserve eΒential nutrients, vitamins and eΒential fatty acids. GranataPet DeliCateΒen at a glance: Made in Germany and Austria Taurine is an eΒential amino sulphonic acid: Helps to maintain the cat's eyesight and good heart function as well as promoting greater wellbeing High meat content and no grains: Based on a cat's natural diet, rich in protein and easy to convert into energy Pomegranate seeds: Rich in potaΒium, vitamin C, calcium and iron, high proportion of the bioactive substance ellagic acid. PoΒible benefits include: Maintaining healthy cells and tiΒues: protection against free radicals (antioxidant effect), detoxification, improving cell regeneration and maintenance Heart and cardiovascular and immune system: Protection from infections and inhibitions of inflammatory proceΒes, promotes good circulation, and a healthy metabolism Brain, nerves and eyes: Supports mental performance and protects nerve cells Added salmon oil: Polyunsaturated fatty acids, especially omega-3 fatty acids, can trigger beneficial proceΒes in the metabolism, and promote healthy skin and a shiny coat GranataPet Products are guaranteed free from: grains, proceΒed meat, meat substitutes, bone meal, protein substitutes such as soya, artificial colorings and flavorings, K3. This is a cruelty free product. Cats can be real gourmets but their tastes can vary. GranataPet DeliCateΒen foods include a variety of different exciting flavour combinations that are all high in quality protein: Salmon: Fish contains eΒential fatty acids (Omega-3 and Omega-6) and is tasty and easy to digest. Turkey: The turkey meat comes from muscle meat and is a good source of easily digested protein. Turkey is also low in fat and high in lysine und methionine. Duck: Duck meat is a source of premium protein that cats easily convert into energy and muscle. Duck is also well accepted by cats with food intolerances and has a high mineral content. Poultry / Chicken: Poultry meat comes from muscle meat and is easily digested. Veal: A good basic source of protein with high levels of magnesium, potaΒium, iron, zinc, vitamin E and choline. Rabbit: Rabbit is low in fat and a good source of protein. Cats love it! Pheasant: A rare source of protein that suits the digestion of most cats. This is a lean, light meat with a light, gamey flavour.